Motor starting and its associated problems are well-known to many people who have worked on large industrial processes. This post is a quick introduction to motor starting. Motors have been in use for over 100 years, and during that time there has been relatively little change in how they function. 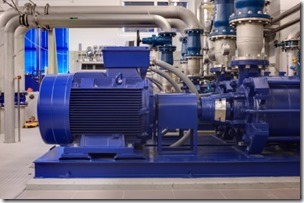 The induction motor is by far the most widely used motor in industrial and building applications. As such, this book concentrates primarily on the application of motor starting in connection with induction motors. Motor starting time is the period from when the electrical supply is connected to the motor to when the motor accelerates to full speed. The length of the starting period is dependent on the combination of the motor and mechanical load, and it can be anything from a fraction of a second to 30 seconds or longer. High levels of current are required during the start-up period, and they can have detrimental effects on the electrical supply system and other equipment connected to it. The duration of starting transients depends on the load characteristics and how long it takes the motor to run up to speed. The figure below illustrates what happens during motor starting. During the starting period a current significantly larger than the motor’s normal full load running current is drawn, the magnetic fields within the motor and back emf increase, and the mechanical load accelerates. The start-up current can be as high as five to eight times the full load current. Electrical systems are designed to cater for the steady state running period conditions. The cables are sized to accommodate the steady state running conditions, and voltage drops across the electrical system are calculated based on the steady state conditions. During the motor starting period the cables will carry more current than during the steady state running period. 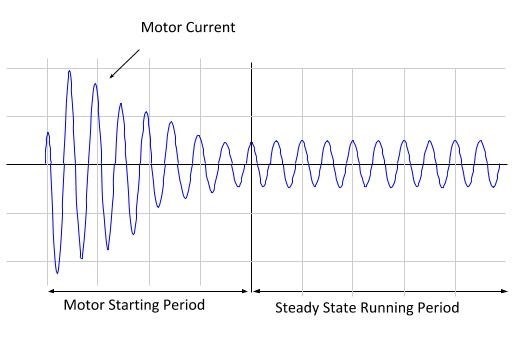 System voltage drops will also be much larger during the starting period than during the steady state running period – this becomes particularly apparent when large motors are started, and / or if many motors are started at the same time. If the voltage drop to the motor itself is too great during the starting period, the motor may be unable to develop sufficient torque to accelerate the mechanical load. In addition, voltage drops within an electrical system may affect other equipment, even to the extent of causing failures. As the use of motors became widespread, overcoming motor starting problems became a concern for engineers. Over the years, many methods and techniques – each with its own advantages and limitations – have been developed to address the issues around motor starting. DOL and star-delta are by far the most commonly employed methods of motor starting. However, there have recently been massive strides made in the utilisation of electronics in regulating electrical power to motors, and electronic starting is fast catching up with DOL and star-delta. These advances can be utilised to allow the motor to operate with very specific acceleration characteristics. 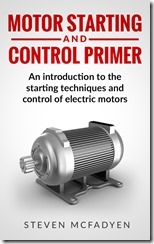 This introduction to motor starting is an extract from my short introductory book on the subject. If you want to delve into motor starting and understand how to the various types of starter work, please check out book. The book is available in paperback eBook format at all Amazon stores. For a 5HP 3 phase induction motor, what is the time duration for which transients in current are expected to appear?? And if maximum load torque for this motor is 20Nm, rated speed 1750rpm, then is it advisable to start motor with load torque=10Nm and speed about 1680 rpm?? P.S. : I am making a indirect vector control simulation motor for a drive.. Please reply with you valuable advise. The above note should also give you some guidance on your starting torque question. Effectively this is a calculation you need to do to see how the motor will behave. I want to know whether we should connect the small motors running on DOL starter in Star OR In Delta? Check the motor name plate. It should provide the answer.